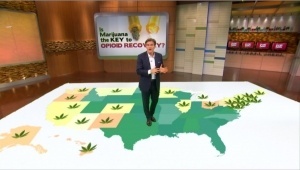 Opioid painkiller addiction is the fastest growing drug addiction in the United States today, and it was recently featured on the popular Dr. Oz TV show . Dr. Oz pointed out the astonishing statistics that 48 million Americans, one out of every 5, have reported that they have abused prescription drugs. 12 states have more opioid pain pill prescriptions than people. In states where marijuana is legal, however, opioid prescriptions are declining. 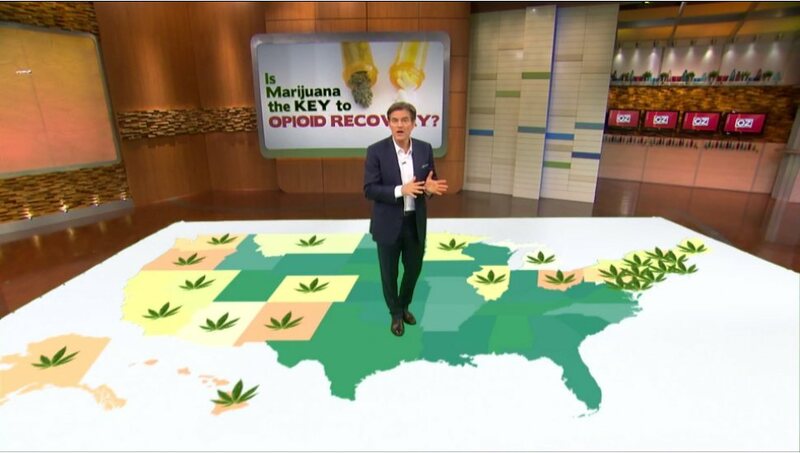 Dr. Oz looks at the question: Is marijuana the new gateway drug OUT of opioid addiction? Many health practitioners are aware of the current epidemic of opioid addiction from prescribed painkiller drugs. The most popular opioid painkillers prescribed are Oxycontin, Percodan, and Percocet. Of course there are other painkillers in the oxycodone category as well. All opioids are opiates, derived from the eighty percent (80%) of heroin addicts who were once prescribed opioid drugs for legitimate pain concerns. In the UK, heroin is actually prescribed as a painkiller. Ironically, the synthetic opioid methadone is used to replace heroin among most addicts. It is also prescribed as a painkiller. Morphine is an opioid painkiller with the longest history of prescription. It is often prescribed for cancer patients in pain. It can actually shut down organ function. Maybe that’s why it is usually prescribed for terminal cancer patients in hospice. These are the often prescribed drugs that are the foundation of the opioid addiction epidemic. What happens often is a patient is prescribed an opioid pharmaceutical for legitimate pain. After some use, the addiction sets in, a person feels sick if he quits or his prescription is no longer filled because the physician observes the problem creating pain is healed. But the patient has become so addicted he or she feels there is no way to handle daily living without them. Even while using opioids under doctors’ care, patients usually have to increase dosage in order to handle the same level of pain. As they increase dosages, their inability to do without increases and withdrawal symptoms make it difficult for most to stop. Increased dosing leads to increased risk of death from overdosing, when opioid drugs cause breathing to halt or the heart to stop pumping. Opioids are the number one killer among prescribed pharmaceutical drugs. Prescribed opioid use has increased 400 percent since 1999, and the drug overdose death toll has increased accordingly. This is the same phenomenon as heroine overdosing. As a matter of fact, many prescription opioid users who at first turn to opioids sold on the street without prescriptions become heroin users. Street heroin is cheaper than street Oxycontin, for example. Dr. Mehmed Oz spotlighted this recently (October 2016) in a Dr. Oz telecast. You can view it here . The focus was on a recovering methadone addict in an informal cannabis camp in Maine who had been hooked on legally prescribed methadone for 10 years. Dr. Oz’s guest Krishna Andavalu visited a somewhat informal rehab camp using cannabis to follow that one person’s withdrawal from long term methadone use. Dr. Oz and Krishna Andavalu considered the camp an unofficial rehab center operating in a medical marijuana legal state. Dr. Oz brought up several valid points regarding the inaccessibility of affordable treatment centers for opioid painkiller addicts, most of whom tend to be white middle class. But the fact is even the best rehab centers have a low rate of success and a high rate of recidivism after their few successes. But they make a lot of money, sort of like mainstream oncology’s efforts with cancer. Although any positive national exposure on cannabis medicine is welcome, the Oz show could have been a little less conservative from this author’s perspective. Instead, it focused on an informal setting that used cannabis to help addicts, successfully, and ignored the fact that Maine has several physicians and centers using cannabis in highly professional settings. The doctor most involved with cannabis for kicking opioid addictions using reefer rehab is an osteopathic physician  or D.O., Dr. David Sulak, who has been running two Integr8 Health Clinics  in Maine and one in nearby Massachusetts. He was not even mentioned. Dr. Sulak, D.O., and his associates have developed a successful protocol for using cannabis to help opioid addicts withdraw and even help eliminate the pain that had driven them to opioid painkillers. Their success rate is very high. They also use cannabis for other medical conditions, even analyzing the various complex entourage effects of different strains in their labs to determine which strains work best for different medical maladies. Dr. Sulak appears to be one of the nation’s leading cannabis doctors in general. He is involved with outreaching to other physicians in medical marijuana legal states and guiding them with successful cannabis applications to other health problems as well. During Dr. Sulak’s intermission, two heads of orthodox rehab centers appeared to confess and confirm the inadequacy of orthodox rehab counseling. They explained how the DEA’s refusal to change cannabis’ Schedule 1 rating has made it impossible for mainstream rehab centers to allow cannabis. This was corroborated by Dr. Oz’s and Krishna Andavalu’s concern for changing national marijuana laws that would allow more research. Currently, orthodox rehab centers disqualify those who use cannabis to help them get through withdrawal in non-legal medical marijuana states. Dr. James Li, M.D., was an E.R. physician who now prescribes cannabis for pain. He also gave a lecture to practicing physicians in Portland, Maine earlier in 2014. Dr. Li showed slides of how cannabis is more effective than opioids or opiates (both the same) for chronic neurological pain among diabetics and MS patients, rheumatoid arthritis (RA) patients, and AIDS patients. These slides were from actual double blind randomized placebo control trials conducted globally in recent years. He also showed figures from various addiction center heads who rated cannabis the least addictive with less dependency issues among other compounds, which included opioids, alcohol, nicotine, and caffeine. Another issue Dr. Li addressed was a study that demonstrated cannabis did not require higher dosing even after two years of using it for chronic pain. Opioids and opiate derived painkillers require increased dosages even after a few months, unless used with cannabis. Cannabis increases opioid efficacy without increasing its dosage. Dr. Li also mentioned that the FDA considers opioids risky and not evidence based for reducing pain, which begs the question why has the FDA approved them for the DEA to consider them of medical use while it refuses to approve cannabis unless it is a synthetically isolated pharmaceutical? It’s interesting to note another fact from both Maine cannabis doctors: double blind placebo control testing for opioids usually have high dropout rates due to intolerable side effects. Among those tested with cannabis or cannabis extracts, there were no dropouts due to adverse side effects.